President Donald Trump has visited the luxury Floridian retreat of Mar-a-Lago every weekend since he came into office, discussing matters of national security with foreign leaders in front of other diners in between rounds of golf. According to the Palm Beach Post, Trump has spent 242 hours in the Sunshine State thus far, almost 23 percent of his time as president. 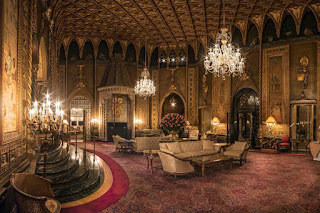 Trump’s weekend sojourns, which Politico has estimated cost taxpayers $3 million per trip, have caused Mar-a-Lago membership fees to double from $100,000 to $200,000, as America’s wealthy clamours for a seat at, or at least near, the table. We telephoned the club this week to try and find out how many applications for membership had been filed since Trump took office and how this compares to previous years. “That’s an inappropriate question and that information is private,” said Executive Administrative Assistant Gloria Myers. Democratic senators on Monday called for Trump to release logs of visitors to the White House and Mar-a-Lago in accordance with a policy that made public the names of nearly six million visitors to the White House during the Obama administration. Notable members at Mar-a-Lago include, according to Politico and The New York Times: CEO of Interactive Brokers Group Thomas Peterffy, lobbyist for Pfizer Kenneth M. Duberstein, founder of oil refiner Oxbow Carbon Bill Koch and New England Patriots head coach Bill Belichick.